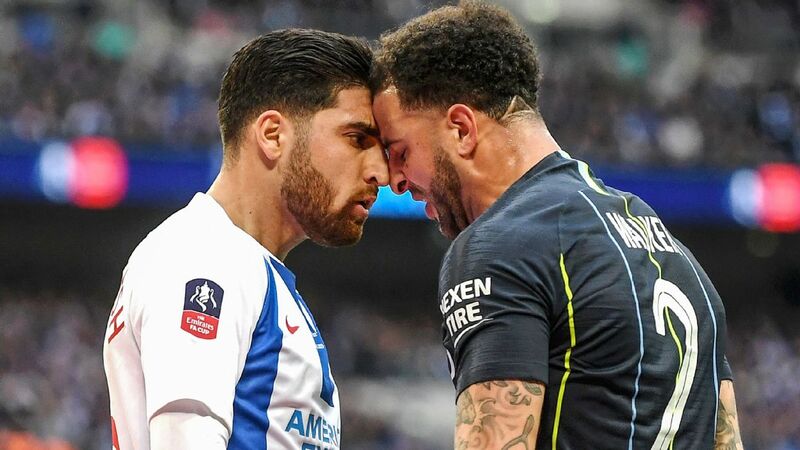 Manchester City's Kyle Walker gets up close and personal with Brighton's Alireza Jahanbakhsh. LONDON, England -- Pep Guardiola insists that winning the Quadruple will be "almost impossible" after he suffered another injury setback as Manchester City reached the FA Cup final. Kyle Walker was taken off at half-time in the 1-0 victory over Brighton while the City boss revealed that Sergio Aguero, who missed the game through injury, has not trained since last Sunday. "I will announce something to you, it is almost impossible to win the Quadruple, almost," Guardiola told a news conference. "Put it in the headlines, guys. It is almost impossible to win the Quadruple. Surviving in that stage of the competitions is already a miracle. [No club has gone to April 17 still in contention] that is why it is incredible what these players have done last season when you achieve 100 points. Neither Liverpool nor Manchester City can repeat that. The year after, when you have the tendency to be arrogant or a little more presumptuous or think you are something that really you are not. And still, we are there. That's why it's incredible what these players have done before. "Every game we lose players but that is normal when you play a lot of games. We are going to try until the end, every game." City struggled to a 1-0 win with Gabriel Jesus's fourth-minute header from Kevin De Bruyne's dangerous cross the defining moment. But while it wasn't as impressive of a victory as recent performances, Guardiola insisted it is ridiculous to expect his side to play well in every match. "Do you believe we can play 60 games in a season and win 5-0 and have a good performance in every game?" he added. "Which team can do that? Even the teams for Trebles in other countries. "I don't remember, I didn't see, but I think when Sir Alex Ferguson won the Treble, in that case not all the games were fantastic and winning 4-0 or 5-0. "Normally semifinals and finals are games like this. You can analyse how many chances we create, but people expect from how good we are that we have to score I don't know how many goals. In this game, in this job, it doesn't work in that way." Brighton boss Chris Hughton praised his players for running City close and said defender Walker should have been sent off for a red card. The England international was shown a yellow card for brushing his head against Brighton winger Alireza Jahanbakhsh and the decision was backed by the Video Assistant Referee. Kyle Walker should have been sent off for this clash with Alireza Jahanbakhsh, said Brighton boss Chris Hughton. "In my opinion, it was a red card," Hughton said. "We ask players to be honest and Ali doesn't make a big meal of it. We certainly would have seen in the past players going down clutching their head and rolling on the floor. "There will have been numerous circumstances where that action would get somebody a red card and the action was sufficient to warrant it. "Everyone is pushing for [VAR]. I am one that has been converted a little bit, although I am not sure how far it is going to take things. It's even more disappointing that it was a VAR. "Ali did the correct thing. We can't want the game to be a better game and take simulation out of the game and expect your players to be any different. "It's not Ali's responsibility to make the right decision. That is down to the officials."